The University of Missouri Student American Institute of Floral Designers (SAIFD) has created two life-size gingerbread houses for the Ronald McDonald House Charities of Mid-Missouri. Photo courtesy Leleighan Kraft Cravens. The University of Missouri Student American Institute of Floral Designers (SAIFD) puts their artistic flair into every project that they partake in. The club is also focused on giving back to the community. That artistic flair has been in overdrive during the club’s most recent project, a special one for the Ronald McDonald House Charities of Mid-Missouri. The annual Build a House for the House Gingerbread House competition and display event is scheduled for Sunday, Nov. 12 – and Mizzou SAIFD had the task of creating two large gingerbread houses for the event. The houses will be stationed at the entrance and exit of the gingerbread house showcase. The houses are being made so that Ronald McDonald House Charities of Mid-Missouri can use them every year for their event. Pool noodles were used for several different items, from candies to candy canes. Photo courtesy of Lesleighan Kraft Cravens. Mizzou SAIFD put in a bid for the project last year and was awarded the opportunity to build the houses in October. They were given a budget and went right to work designing the outline of the houses. The club has around 20 members, with eight of them putting in a lot of time on the project. The club had some extra help for the project, as Cravens’ parents and husband played a big role in the project. Cravens’ husband Chris, a research specialist in the Division of Plant Sciences, and her dad built the first house, which is six feet tall and seven feet deep. The students built the second house following their model, with the same dimensions. “My dad teaches woodworking and welding at a community college and Chris has a knack for building things like this as well,” Cravens said. “He built our kitchen table and headboard. I’m very different than both of them in how they attack projects. I just kind of let the creativity go and project will be what it will be. Both of them go into everything with a plan. They know what will work and won’t work. Trial and error were a common theme throughout the design stage. Cravens said they went through nearly 700 paper plates, trying to find the best way to utilize them. A lot of work went into coming up with ways to make peppermints, candy canes, presents and lollipops. The group painted paper plates to make peppermints and used pool noodles, covered in wrapping paper, to create candy canes. The noodles were also used to create lollipops. They were rolled up and wrapped with duct tape to stay together. Paper plates were also used to create other candies. 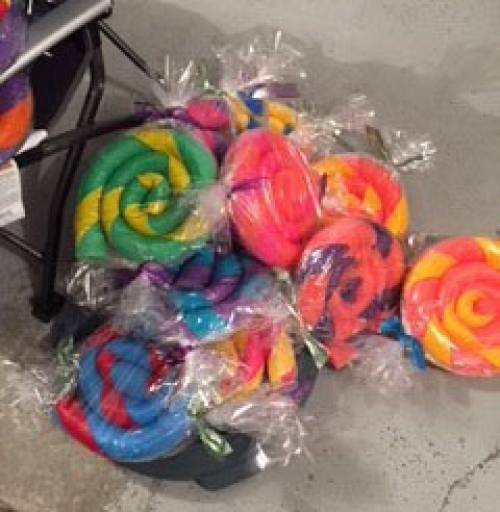 The candies and lollipops were wrapped in cellophane to give them an official touch. 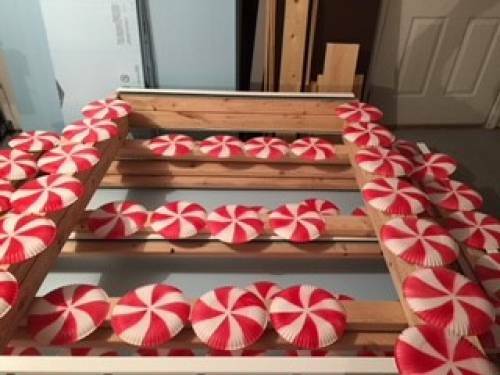 Cravens turned sand pails into gumdrops and created her own version of ribbon candy. Boxes of all sizes were also collected to turn into presents. Mizzou SAIFD has gone through nearly 700 paper plates in designing the gingerbread houses. Photo courtesy of Lesleighan Kraft Cravens. “We’ve never done anything this size before, so there was a lot of trying something and figuring out if it would actually work,” Cravens said. “For example, Velcro doesn’t stick to the insulation board – we learned that two weeks ago. We were then playing with something similar to the adhesive on the back of a credit card, which was labor intensive. Cellophane also rips really easily so we have to be careful. The framework for both houses are made of 2x4s and insulation board. All of the candy will be attached to the houses through various methods. The Build a House for the House Gingerbread House competition and display event will run from 11 a.m. to 3 p.m. on Sunday, Nov. 12, in the Dillard’s Wing of the Columbia Mall. Several gingerbread houses will be on display to be viewed and voted on. Cravens and Mizzou SAIFD are doing videos on their Facebook page about some of their design process.